The Messenger wears its inspiration on its sleeve. 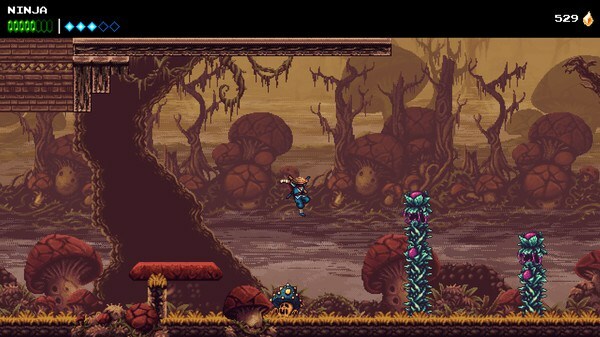 The retro-inspired platformer from developer Sabotage takes equal parts inspiration from the game series’ Ninja Gaiden and Metroid, mixing fast, hack-and-slash action platforming with sprawling levels and numerous paths and secrets to find. 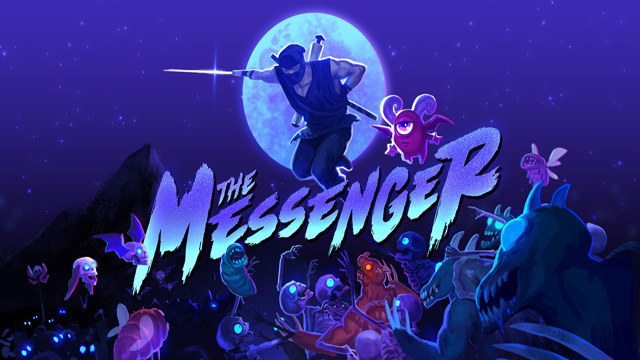 Retro throwback games have become a dime a dozen, but The Messenger does it with style and dignity. It takes the best of both worlds it’s inspired by and creates something compelling, challenging and fun. You play a young ninja who dreams of something more than this providential life of ninja training. When tragedy suddenly strikes at his ninja school and a demon army invades the land, you set out on your journey through forests, caves, mines, swamps, and temples of varying danger. 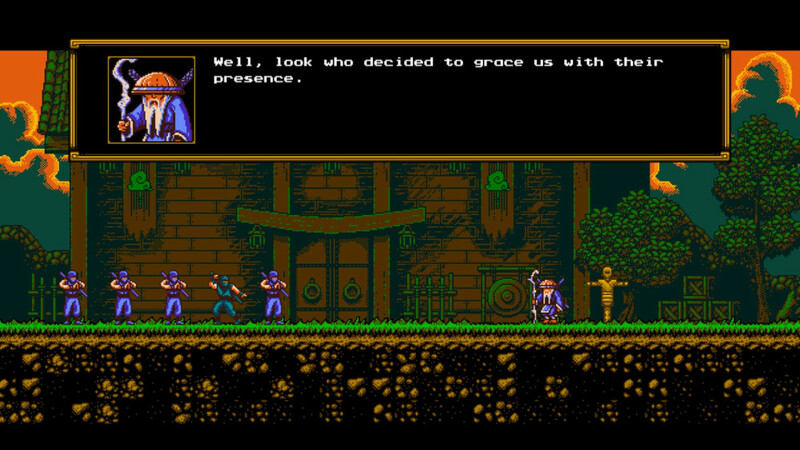 There’s a surprising amount of narrative tissue in The Messenger and plenty of talking considering the vintage style. Luckily, the dialogue snaps and pops with character and humor, keeping you invested in the story. Everyone from the main character to the shop keeps and bosses has a personality and bounce off each other in cute ways. 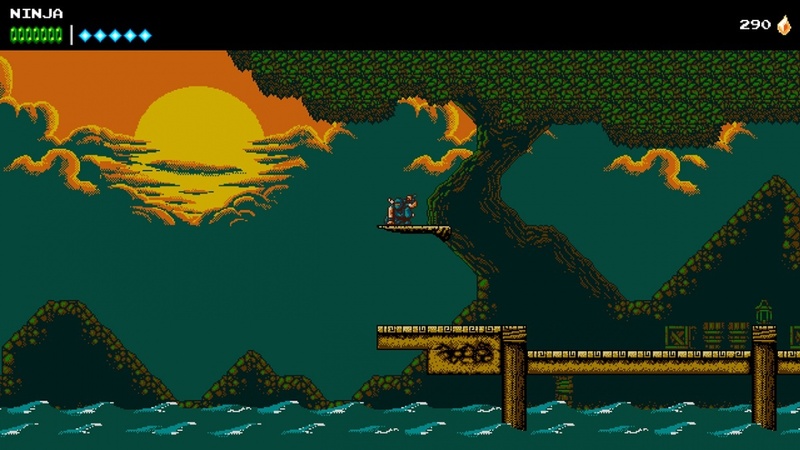 The Messenger begins with the appearance of an 8-bit NES platformer, with the playable ninja bearing more than a passing resemblance to famous 8-bit ninja Ryu Hayabusa. You platform through a multitude of challenging levels, taking on boss battles at the end of each level before moving to the next area. The journey takes a surprise turn at its mid-point, extending the adventure and bounding in scope. We’re talking a Turtles in Time level of your life getting flip-turned upside down. After what would be any other game’s final boss, you’re flung into the future, aka 16-bit land. The graphics and sound now take a generational leap forward. Your ninja still plays the same with no tangible difference in mechanical complexity, but now his outward appearance is more akin to a traditional samurai. The early play mechanics are fairly straightforward. Your ninja sword can be used against enemies and as a hook of sorts on objects and those same enemies to get a jump boost, essential to cross chasms and enter high areas out of reach. As you progress, you get complimentary abilities like a wall jump, a hookshot, double-jumps, and more. Level design evolves with your growing suite of moves to take advantage of these acrobatics, and mastering these moves is essential to perform death-defying leaps over great abysses, tall vertical corridors, and tight puzzle box rooms to progress. Once you’ve mastered your various tools and can conquer deadly jumps, you’ll be flying high defying gravity like a sweet 16-bit eagle to the sea as you must chain slices to leap higher and quickly leap across walls to avoid all manner of deadly spikes and what have you. It’s tough to master, but when you do, leaping around and reaching everywhere in each level is plentiful fun. Once 16-bit mode is introduced, you’ll return to previous levels with a fresh new map in tow, to uncover a series of mystical musical notes to unlock the final level. A new mechanic is introduced where you can now travel between the past you begin the game in and the far flung future (shades of Guacamelee here and its flipping between lands of the living and dead). The time travel mechanic is used to clever effect and key to completing all of the maps, finding extra hidden items and carving a path to the music notes to unlock the final boss. You’ll see previous levels in a whole new way, uncovering new paths and secrets that were previously inaccessible, but also must work around how the level changes in both modes to navigate to the fullest. Exits and entire pathways open and close depending on the mode, like a tree in full bloom in 16-bits that closes off a clear path you can easily navigate in 8-bits. 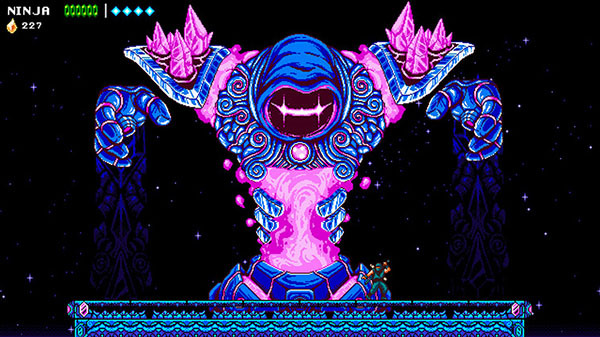 If the platforming and exploration offers a challenge of dexterity, boss battles are a match of wits. They have a decent amount of variety between them, with a towering stone golem you have to trapeze across and around danger to reach its weak point, dueling ogres, and even a side-scrolling shooter through the clouds. The boss battles provide the greatest challenge with their varied, difficult patterns that take some practice to figure out. Regular enemies themselves are no slouch. With a good deal of visual variety and their numerous ways of exploiting your movement to hit you, the various demons, rock monsters, and fire-breathing dragons will keep you on your toes. 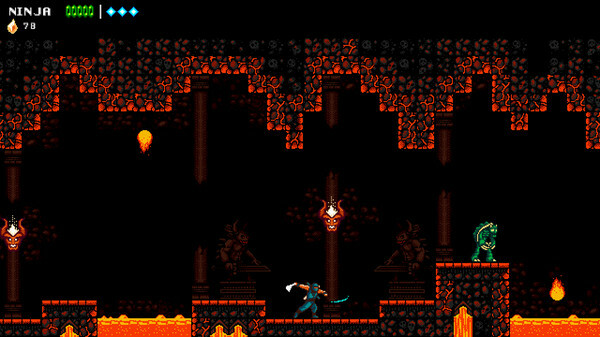 The Messenger encourages exploration with its 50-odd green Power Gems scattered in almost every level. In pure 8-bit mode, you won’t see nearly half of them in the past, but once you’ve acquired the map and can switch to the future, you’ll handily be able to find the rest. The art of collecting each Gem ranges from breezy to incredibly infuriating, attributed to their location which are the most puzzle box areas of the game. They’re all out in the open, you just need to master the path to reach them. All the while, you’re collecting crystal gems to farm up for character upgrades .These buffs for health and defense, additional ninja star throws, and further ability boosts make your ninja even more flexible and durable. If you haven’t fully upgraded by the end of the game, it’s very hard not to given the copious amount of currency you’ll stock up on. Without a traditional lives counter as in the olden days, you’ll just kick back to the last checkpoint and the penalty for death is payment. A cheeky imp named Quarble follows you around, briefly collecting all the crystal gem shards you collect in real-time before taking off till the next death. The only real fatiguing part of The Messenger is backtracking through old levels to find that one missing collectible tucked away. There are only a few new levels introduced once you enter 16-bit, including that first level in said mode. And sometimes you come across moments where you feel the urge to snap your controller in half. 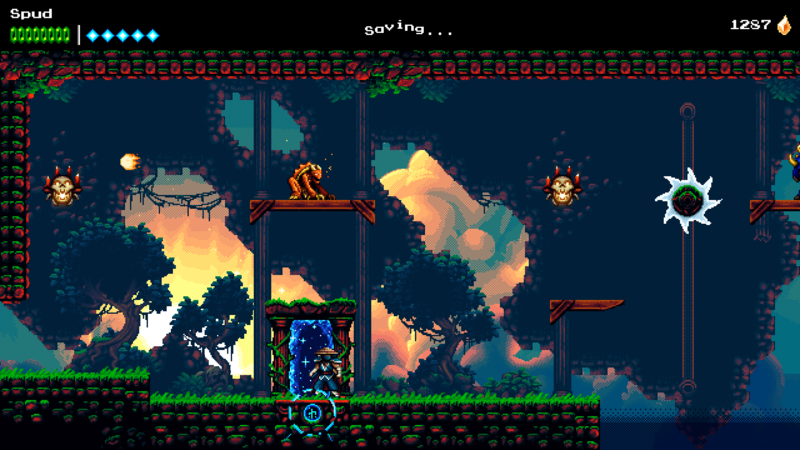 In fairness, it never feels like The Messenger‘s design is cheap, more that it’s on you to perfect your movement and the snappy controls to pull through its toughest beats. It’s almost worth the constant fumbles just to read the demonic imp sass you on the would-be Game Over screens (the best of their kind since Runbow). Whether in 8-bits or 16-bits, the pixel art is vivid and colorful. Each level oozes atmosphere and rich detail, conveying dark forests, craggy swamps, and icy castles among other locales. Enemy designs are just as vivid to behold and are well animated, bosses particularly impress with smooth sprite animations and range, from normal-sized terrors to towering, multi-faceted sprites with copious animation that would have been impossible on authentic NES hardware. 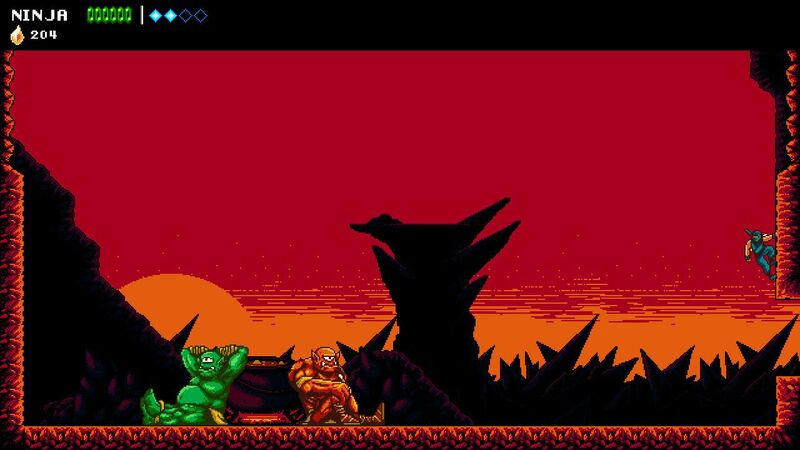 When in 16-bit mode, the graphics not only gain more color and detail, the levels’s appearance transform. To wit, a cloud-filled castle in the sky that is blue and bright in 16-bit turns out to be a dark, stormy temple in 8-bit. In motion, performance is a sound 60 frames per second, with rare bouts of slowdown in the busiest and densest of levels. The compositions by Rainbowdragoneyes are as impressive as the visual, perhaps the funkiest retro throwback music this side of Jake Kaufman’s impressive Shovel Knight soundtrack. When in 16-bit, the tunes take inspiration from the SEGA Genesis (Mega Drive for your European readers) soundscape, a specificity to be lauded. The 16-bit music is just as nice as in 8-bit, but the 8-bit version of the soundtrack is simply more catchy and upbeat, speaking to the cultural carrying of the nostalgic Nintendo flame. With clear cut inspiration from Tecmo’s classic Ninja Gaiden series, The Messenger compares favorably and then some. Elder statesman gamers will tell you how they cut their teeth on the seminal NES classics with its ruthless, no-prisoners challenge, and The Messenger is nowhere near that level of cruelty. This plays much smoother and less stiffly, and the numerous upgrades you can buy to boost your ninja makes it all the more fair to your energy and time. As for the Metroid side of the coin, it’s not as open as the typical genre they call “Metroidvania”. Like in this sub-genre, there are plenty of hidden items and rooms to find in the average level, but the campaign is ultimately linear in its progression. You’ll never get lost like you would in the original 1986 Metroid, but there may be a spot in the game’s latter half where you’ll be momentarily stuck for the next music note clue. 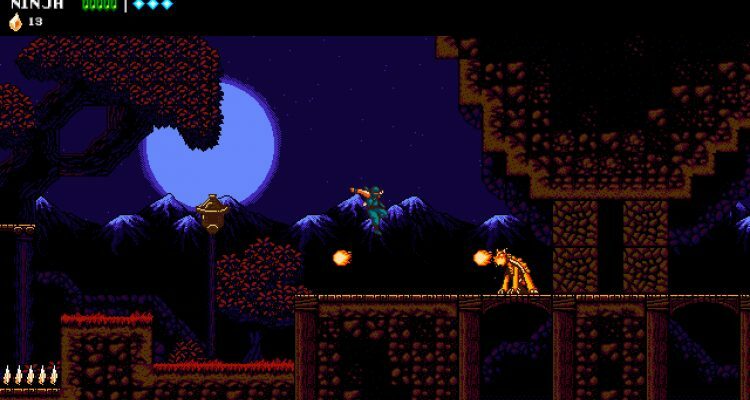 At around 15 hours to complete, The Messenger is shorter than a typical Metroid or latter-day Castlevania, give or take, but it’s a fun ride while it lasts. 2018 has been a great year for retro-style exploratory platformers, as seen with Celeste and Dead Cells. 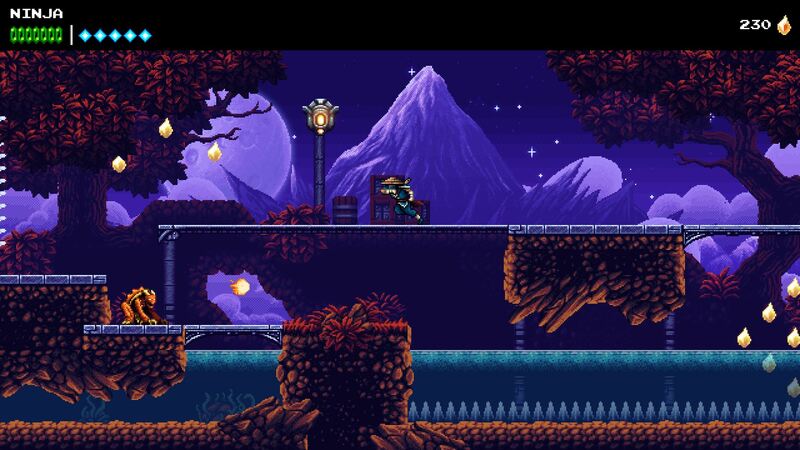 The Messenger continues that trend with aplomb with smooth controls, great presentation, and plenty of challenging and exciting levels to explore. It’s much more fair than its inspirations, but you will still die a lot (my final count clocked in at well over 300 and I payed over 1000 gems). If you love classic gaming with new twists, be sure to spread the message that The Messenger is another indie keeper.